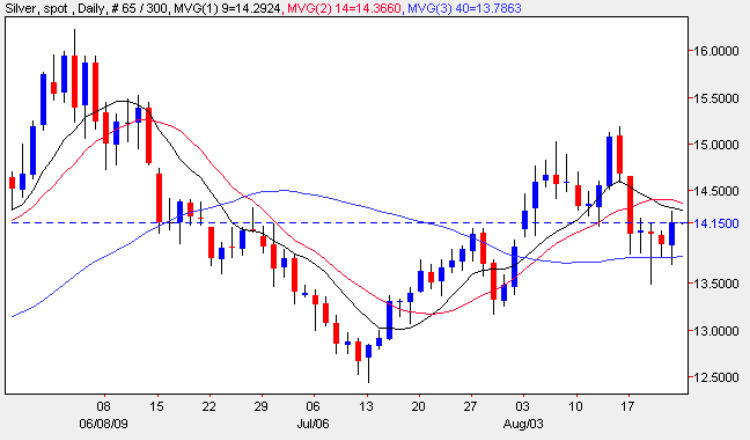 Silver traders ended the week with some positive signals as the daily candle for Friday ended the silver trading session in positive territory, but sandwiched neatly between all three moving averages, with the low of the day finding some support from the 40 day moving average. Whilst not as dramatic a price move as for gold prices, the up move was signalled technically on Wednesday with the deep hammer candle suggesting a move higher was imminent. This duly arrived Friday and although somewhat muted in its momentum, it will be interesting to see whether this bullish tone continues in the silver trading session at the start of the week. For any technical move higher we need to see a breach of both the 9 day and 14 day moving averages before trading in silver with any degree of certainty. However should this occur and we break and hold above the the $14.50 per ounce level then this should provide a platform for a move towards the $15 per ounce level once again where minor resistance awaits. With gold also waiting to breach a technical level, silver traders my do better to wait on the sidelines tomorrow as the trading session unfolds with gold once again leading the way for these two commodities.